Quote: It’s not some grand conspiracy, but it’s grand theft all the same. Le Pen voters lost their ballots, their rights, by the millions on Sunday. The Le Pen campaign reported it to the election watchdog, saying the ballots were "torn up” in turn the watchdog banned the media from reporting on it. The damn elite are desperate to hold the EU together as long as they can so they can continue the invasion. I suspected there will be some controversy regarding the results. hopefully the interwebs will react and it will become a thing. the rich fucks deserve to get their dirty bums smacked. 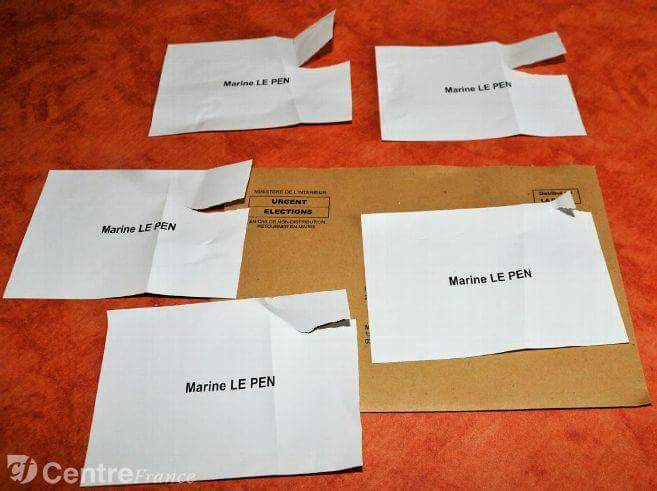 It's a result that will raise the blood pressure of any LePen supporters,,, however, it should irk everyone. They are seeing this on twitter and such, as the locals are forbidden to discuss this. That's some great old prog rock... I haven't heard that in years. Lesson learned from Cankles' debacle ~ if you're gonna' cheat, do it big so you win the rig. of all European national states. addressing the real core problem. (Then demonize and launch open war. Now where do I sign up for the million dollar think-tank..? Well they have their Golden Boy in place. He was groomed for this. He is presented as a centrist outsider but nothing could be further from the truth. And those that do are into other, more creative things. Rest assured nothing will be done. This is alt media, why isn't CNN and MSNBC reporting this?